Stream allows us to estimate the maximum performance increase that DDR-2400 (Xeon E5 v4) can offer over DDR-2133 (Xeon E5 v3). 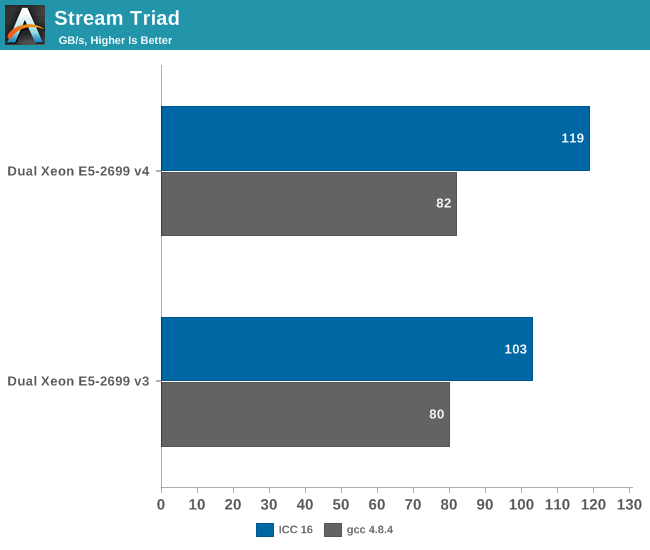 The Xeon E5 v4 with DDR4-2400 delivers about 15% higher performance then the v3 when we compile Stream with icc. To put this into perspective: DDR-4 @ 1600 delivered 80 GB/s. The difference between DDR-4 2400 and DDR-4 2133 is negligible with gcc. Average time is measured for random memory accesses in the buffers of different sizes. The larger the buffer, the more significant the relative contributions of TLB, L1/L2 cache misses, and DRAM accesses become. All the numbers represent extra time, which needs to be added to L1 cache latency (4 cycles). We tested with dual random read, as we wanted to see how the memory system coped with multiple read requests. The larger the L3 caches get, the higher the latency. 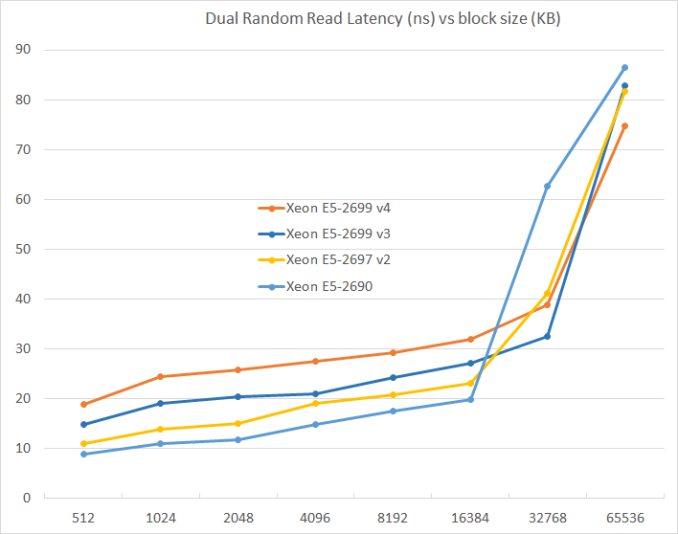 Latency has almost doubled from the Xeon E5 v1 to the Xeon E5 v4 while capacity has almost tripled (55 MB vs 20 MB). Still, this will result in a small performance hit in many non-virtualized applications that do no need such a large L3. -Hadoop, sort 10TB data: one SPARC M7 server with four cpus, finishes the sort in 4,260 seconds. Whereas a cluster of 32 PCs equipped with dual E5-2680v2 finishes in 1,054 seconds, i.e. 64 Intel Xeon cpus vs four SPARC M7 cpus. If we talk about how encryption affects performance, lets look at this benchmark below. Never mind the x86 is slower than the SPARC M7, let us instead look at how encryption affects the cpus. What performance hit has encryption? -For x86 we see that two E5-2699v3 cpus utilization goes from 40% without crypto, up to 80% with crypto. This leaves the x86 server with very little headroom to do anything else than executing one query. At the same time, the x86 server took 25-30% longer time to process the query. This shows that encryption has a huge impact on x86. You can not do useful work with two x86 cpus, except executing a query. If you need to do additional work, get four x86 xeons instead. -If we look at how SPARC M7 gets affected by encryption, we see that cpu utilization went up from 30% up to 40%. So you have lot of headroom to do additional work while processing the query. At the same time, the SPARC cpu took 2% longer time to process the query. It is not really interesting that this single SPARC M7 cpu is 30% faster than two E5-2699v3 in absolute numbers. No, we are looking at how much worse the performance gets affected when we turn on encryption. In case of x86, we see that the cpus gets twice the load, so they are almost fully loaded, only by turning on encryption. At the same time taking longer time to process the work. Ergo, you can not do any additional work with x86 with crypto. With SPARC, it ends up with 40% cpu utilization so you can do additional work on SPARC, and process time does not increase at all (2%). This proves that x86 encryption halves performance or worse.